Algae are an heterogeneous group of plants with a complex and often controversial taxonomy. There are two main types of algae: the macroalgae (seaweeds), which occupy the littoral zone and can be of very large size, and the small-sized microalgae, which are found in benthic and littoral habitats as well as throughout the ocean waters as phytoplankton (Hasan et al., 2009; El Gamal, 2012). There are about 10,000 species of seaweeds (Guiry, 2014), but only a few of them are of interest in animal feeding. This datasheet deals exclusively with seaweeds: for the utilization of microalgae species such as spirulina (Arthrospira) in animal feeding, see the Microalgae datasheet. The term "seaweed" does not have any taxonomic value, but is a popular term used to describe the common large marine algae. They include brown algae (Phaeophyceae), red algae (Rhodophyceae) and green algae (Chlorophyceae) (Chapman et al., 1980; El Gamal, 2012). Seaweeds are of many different shapes, sizes, composition and colours, and occupy various habitats. Some remain attached to rocks or other supporting material. Some are attached to the ocean floor through rootlike structures (holdfasts). Some float on the water surface and form single or multi-celled colonies (Murty et al., 2012). Brown algae are the largest seaweeds, up to 35-45 m in length for some species and extremely variable in shape. The most common genera include Ascophyllum, Laminaria, Saccharina, Macrocystis, Nereocystis, and Sargassum, often called kelp (Murty et al., 2012). Brown algae live primarily in shallow waters or on shoreline rocks, and have very flexible stems that allow them to withstand the constant pounding of the waves (Ghosh et al., 2012). Due to their larger size and relatively easier accessibility for harvesting, brown seaweeds have been more studied and are more exploited than other algae types for their use in animal feeding. Ascophyllum nodosum (L.) Le Jolis has long, leathery fronds (up to 2 m in length) with characteristic ovoid air-bladders. It occurs in the mid-littoral zone in wave-sheltered rock shores of the northern Atlantic, from the Artic shores to Portugal and New Jersey. Ascophyllum nodosum is harvested in Europe (Norway, Ireland and Iceland) for alginate, feed and fertilizer production (Edwards et al., 2012; Guiry et al., 2014; Guiry, 2014). Laminaria and Saccharina (notably Laminaria digitata (Hudson) J. V. Lamouroux, Laminaria hyperborea (Gunnerus) Foslie and Saccharina latissima (L.) C. E. Lane, C. Mayes, Druehl & G. W. Saunders) are characterized by their long (1.5 m) and smooth laminated blades. These algae form extensive beds, mainly in cold-temperate waters of the north Pacific and in the Atlantic. They occur on rocky shores at low tide and in the subtidal zone to depths of 8-30 m, though some species occur at depths of up to 120 m in the Mediterranean and in the South-Western Atlantic. Laminaria and Saccharina have a long history in animal feeding in Western and Northern Europe (Sauvageau, 1920) and are still of great economic importance. They are harvested in Europe and Asia for alginate, food and feed production (Edwards et al., 2012; Guiry et al., 2014; Guiry, 2014). Macrocystis pyrifera (L.) C. Agardh, commonly known as giant kelp, has very large fronds that can reach a length of 50 m or more. It is distributed mainly in the southern hemisphere (South America, Southern Africa, Australia and New Zealand) and in the North-East Pacific coast. It occurs in the shallow part of the tidal zone, and it can be found at depths of up to 40 m. When it can anchor itself to rocky bottom areas, Macrocystis pyrifera forms extensive "kelp forests" that are home to many marine species. It has a very fast growth rate, from 14 to 23 cm/d. Macrocystis pyrifera is harvested for the production of alginate, animal feeds and pharmaceutical additives (Cruz-Suarez et al., 2000). Sargassum are brown algae found in temperate, subtropical and tropical waters around the globe. They are of variable size, even within the same species: Sargassum muticum (Yendo) Fensholt is 1-2 m in length in its native Japanese waters but can reach 16 m in Brittany, France. Sargassum species live in a wide range of habitats, and many species have the ability to become free-floating and form large floating mats in open waters (Casas-Valdez et al., 2006; Guiry, 2014). Red algae have a characteristic bright pink colour caused by biliprotein pigments (R-phycoerythrin and R-phycocyanin). Most marine red algae species occur from low tide marks to 100 m depth. Major red algae genera include Pyropia, Porphyra, Chondrus and Palmaria. Pyropia and Porphyra species are red algae with smooth, thin fronds that grow in the intertidal zone of temperate oceans. It is the largest source of food from red seaweeds - it is used in Japanese sushi, for instance - and its cultivation is conducted on a large scale in Japan, China and South Korea (McHugh, 2003). Palmaria palmata (L.) Weber & Mohr has smooth leathery fronts, deep red in autumn and greenish/yellow in summer. Individuals can grow up to 30-40 cm. This species occurs in the North Atlantic and is found in moderately exposed to exposed shores and in areas subjected to tidal currents. It is rich in protein and harvested for food (Edwards et al., 2012). In the 19th and early 20th centuries, Palmaria palmata was appreciated by sheep and goats in Gotland (Sweden) and by cows in Brittany (France) (Sauvageau, 1920). Coralline red algae, notably Phymatolithon and Lithothamnion, are shaped as small nodules that secrete calcium carbonate. Dead coralline algae form calcareous deposits called maerl that are exploited all around the world as a source of calcium carbonate (Edwards et al., 2012). 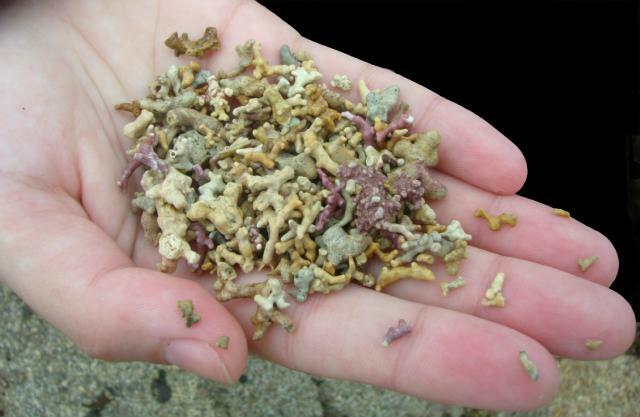 Maerl extracts (under the name of calcified seaweed extracts) are used to create rumen buffers (Melo et al., 2009; Montanez-Valdez et al., 2012). These algae are typically green in colour due to the presence of chlorophyll in their chloroplasts. Their overall coloration depends on the balance between the chlorophylls and other pigments such as beta-carotene and xanthophylls. Main genera include Codium, Enteromorpha, Ulva, Chaetomorpha and Cladophora. Green algae are common in areas where light is abundant, such as shallow waters and tide pools. 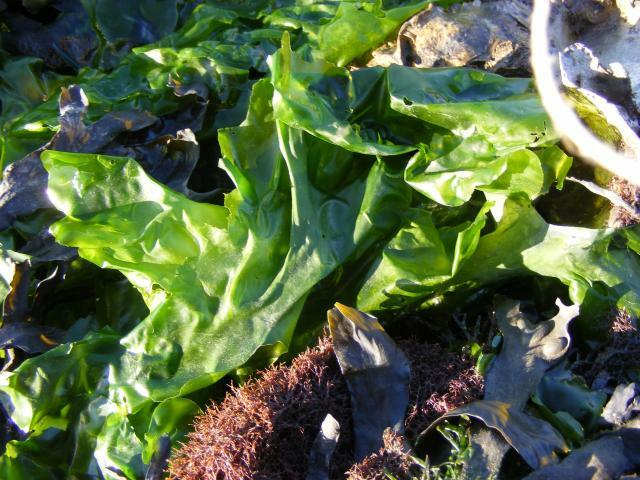 Ulva species are commonly known as sea lettuce, due to their thin and bright green fronds. They can grow up to 45 cm and occur worldwide in the intertidal zone of brackish or marine environments, particularly in estuaries (Edwards et al., 2012). Ulvoids, which include Ulva and related genera (Enteromorpha, Chaetomorpha, Cladophora, Rhizoclonium, Percursaria, Ulvaria) are fast-growing algae. Optimal environmental conditions (temperature, concentration in nutriments) can cause algal blooms called "green tides" that are a major environmental issue in several countries, notably in China, Japan and France (Yabe et al., 2008). All Ulva species are edible (Edwards et al., 2012). Seaweeds have many uses. They are consumed as food in several cultures, notably in Asia. In Japan, the red seaweed nori (Porphyra), is a traditional wrapping for sushi and is eaten in soups. Wakame (Undaria pinnatifida) and kombu (Laminaria japonica) are cultivated for food (Hasan et al., 2009). Seaweeds are used in medicine for the treatment of iodine deficiency (goiter, Basedow’s disease and hyperthyroidism), for intestinal disorders, as vermifuges, and as hypocholesterolemic and hypoglycemic agents (El Gamal, 2012). They provide numerous ingredients to the food or pharmaceutical industries such as hydrocolloids (agar-agar, alginates used as stabilizers, thickeners and fillers), pigments, vitamins, chelated micro-minerals (selenium, chromium, nickel, arsenic) and prebiotic substances in the form of complex carbohydrates (alginates, fucose-containing polymers, mannitol and laminarin) (Evans et al., 2014). Seaweeds (particularly brown and red algae) are used as organic fertilizers that are usually rich in potassium but poorer in nitrogen and phosphorus (Waaland, 1981 cited by Abdel-Raouf et al., 2012). Seaweed species such as Gracilaria (red algae) and Ulva (green algae) are suitable for bioremediation. Seaweeds are used in integrated aquaculture systems (Turan et al., 2009 cited by Troell et al., 2009). Seaweeds have been used to feed livestock for thousands of years and have been mentioned as such in Ancient Greece and in the Icelandic sagas. In Iceland, where long periods of fodder scarcity are common, seaweeds were grazed by sheep on the beaches, or fed to sheep, horses and cattle for 6 to 8 weeks of the year, and up to 18 weeks in some cases. Seaweeds were dried and stored in barns, and there are reports of seaweeds being preserved as silage and used as winter feedstuff for sheep and cattle in the early 1900s (Evans et al., 2014). In the 19th and early 20th centuries, there were numerous reports of occasional or systematic use of seaweeds to feed livestock in France (Brittany), in the Scottish islands and Scandinavia (Gotland, Norway, Finland), mostly to ruminants (including calves) and pigs (Sauvageau, 1920; Chapman et al., 1980). Today, the Orkney sheep in the North Ronaldsay Island (Northern Scotland) are still grazing a diet almost exclusively based on seaweeds (Hansen et al., 2003). Wild white-tailed deers have been observed grazing seaweeds in coastal Maine (USA) (Applegate et al., 1995). During World War I, feed shortages led to a "considerable exaggeration" of the nutritional value of seaweeds (Chapman et al., 1980). In Germany, it was demonstrated that pigs, cows, ducks and sheep could eat a seaweed meal for many months as an additional food, and thrive as well as control animals fed on a normal diet (Beckmann, 1915 and 1916, cited by Chapman et al., 1980). In 1917, the French army carried out several promising experiments in which horses were fed with Laminaria, Saccharina and Fucus (Sauvageau, 1920). However, in the first half of the 20th century, the general consensus, based on nutrition science, was that seaweeds were of too poor nutritive value to be recommended for livestock (Evans et al., 2014). Seaweeds have seen a renewed interest as feed ingredients since the 1960s, when seaweed meal from kelp was produced again in Norway (after a first attempt in 1939-1941) (Naylor, 1976; McHugh, 2002). Seaweeds are valuable alternative feeds for livestock, mostly as sources of valuable nutriments, notably chelated micro-minerals (which were found in the 1970s to be more available than inorganic ones), complex carbohydrates with prebiotic activities (since the 1990s), pigments and polyunsaturated fatty acids beneficial to consumer health (Evans et al., 2014; CEVA, 2005). Soluble kelp extracts obtained from alkaline hydrolysis are used as additives (Allen et al., 2001a; Allen et al., 2001b; Williams et al., 2009). 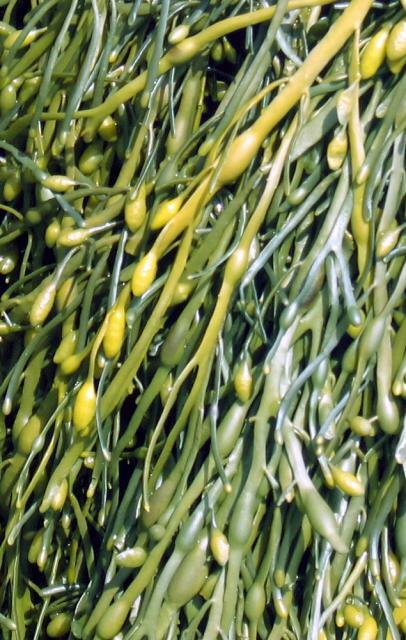 Seaweeds are used as binding agents in shrimp feeds (CEVA, 2005). Seaweeds are usually cultivated in Asia, while they are harvested in the wild in Europe. The main species cultivated for food are Saccharina japonica (Japanese kelp), Eucheuma spp., Gracilaria spp., Porphyra (nori) and Undaria pinnatifida (wakame). Other species such as Sargassum fusiforme and Caulerpa spp. are farmed in small quantities (FAO, 2012). Seaweed meal is produced by drying and milling, and several commercial products are available in Europe, Asia and North America. It is difficult to have a clear picture of the current state of macroalgae utilization in animal feeding. It appears that seaweed meal and extracts obtained from kelp species provide the main commercial ingredients used to feed land animal Ascophyllum nodosum in Norway and the UK, Laminaria digitata in France, Ascophyllum and Laminaria species in Iceland (McHugh, 2002). The culture of seaweed is a growing worldwide industry. Driven by the development of fish farming, seaweed production increased yearly by 9.5% during the 1990s and by 7.4% yearly during the 2000s, from 3.8 million t in 1990 to 19 million t in 2010. In 2012, seaweed production resulted from cultivation (more than 95%) rather than from collection, the main producers being China, Japan and Indonesia (FAO, 2012). However, seaweeds used for animal feeding appear to result mostly from harvesting in the wild. Once harvested, seaweeds must be rapidly handled because they are rich in water and can become mouldy. The wet seaweed is passed through hammer mills with progressively smaller screens to reduce it to fine particles, that are dried in a drum dryer starting at 700-800°C and exiting at no more than 70°C. Seaweed meal should have a final moisture level of about 15% and should be stored in sealed bags. Seaweed meal can be stored for about a year (McHugh, 2003). Seaweeds develop under variable environments. Every species has its own requirements for water salinity, nutrients, water movement, temperature and light. In species that propagate vegetatively, seaweed pieces are tied to ropes or nets, or sunk to the bottom of the pond, unattached or held in place by a fork-shaped tool (in sediments) or sand-filled tubes (in sandy soil). Such species are harvested either by removing the entire plant or by removing most of it, but leaving small pieces that are used as seedstock for further cultivation. In brown seaweeds, which mainly reproduce sexually, only the large sporophyte form is harvested (McHugh, 2003). Seaweeds are home to many invertebrates that are prey for arthropods and marine birds, and high collection rates of seaweeds have been reported to alter the equilibrium of coastal ecosystems. For instance, the harvest of wild kelp in Norway was found to be detrimental to fish abundance and to the foraging efficiency of birds (Lorentsen et al., 2010). In integrated fish farming systems, seaweeds can remove up to 90% of the nutrient discharge from an intensive fish farm. Seaweed cultivation can alleviate eutrophication problems due to aquaculture or to wastewater discharges (Lüning et al., 2003; Merrill, 1996). Seaweeds have a highly variable composition, which depends on the species, time of collection and habitat, together with external conditions such as water temperature, light intensity and nutrient concentration in water. All of these fhese factors influence markedly the content in protein, mineral, lipid and fibre in seaweed (Mišurcová, 2012). One common feature of fresh seaweeds is that they contain very large amounts of water (70-90%) and need to be dried or consumed quickly. Brown algae are of lesser nutritional value than other red and green algae, due to their lower protein and higher mineral contents. Algae may contain non-protein nitrogen (such as free nitrates), resulting in an overestimation of their protein content. Nitrogen-to-protein conversion factors of 5.38, 4.92 and 5.13 for brown, red and green algae respectively have been proposed (Guiry, 2014; Mišurcová, 2012). Some seaweeds such as the red seaweed Palmaria palmata and brown seaweed Undaria pinnatifida have been reported to have valuable amino acid profiles for human nutrition, but variability among seaweeds of the same species was found to be very high (Mišurcová, 2012). Marine macroalgae concentrate minerals from seawater and contain 10 to 20 times the minerals of land plants (Moreda-Piñeiro et al., 2012). They are thus a significant source of valuable minerals for nutrition (Mišurcová, 2012). Brown seaweeds, and particularly Laminaria, accumulate iodine and the coralline red seaweeds, such as Lithothamnion, once dead form exploitable sources of calcium carbonate. Seaweeds contain only small amounts of lipids (1-5% DM), but the majority of those are polyunsaturated n-3 and n-6 fatty acids. Lipids of red and brown seaweeds contain predominantly 20:5 n-3 (EPA) and 20:4 n-6 (arachidonic acid). 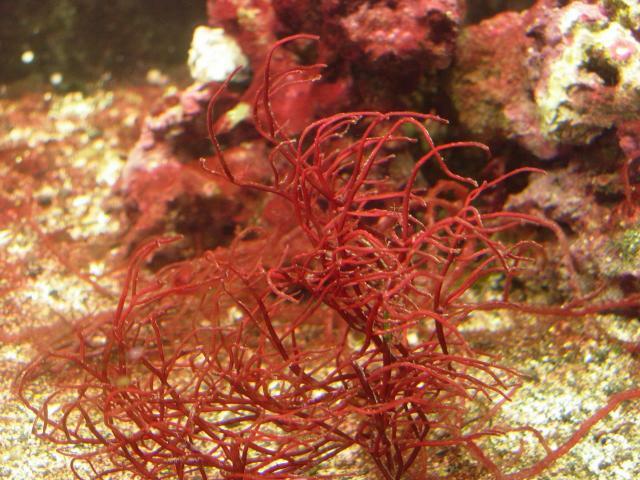 The lipids of the red seaweed Gracilaria changii was found to contain 75% of polyunsaturated fatty acids (33% EPA) while palmitic acid was the main saturated fatty acid with 26% (Norziah et al., 2000). The lipids of the brown seaweed Durvillaea antarctica and the green seaweed Ulva lactuca contained 73 and 52% of unsaturated fatty acids respectively (Mišurcová, 2012). It should be noted that the variability noted in the literature is compounded because numerous reports on algae composition contain mistakes, probably due to a lack of reference data. Brown seaweeds are rich in mineral matter (from 14 to 35% DM) and contain low to moderate amounts of crude protein (5-10% DM for Ascophyllum nodosum, 8-15% DM for Laminaria digitata, 9-11% DM for Macrocystis pyrifera). An early study of Laminaria digitata and Saccharina japonica in Scotland found large differences in composition: crude protein varied from a maximum of 12-14% DM in spring to a minimum of 4-8% in autumn (Black, 1950). Cell walls are made of cellulose and alginic acid, a long-chained heteropolysaccharide that is present in large quantities (15-30% DM for Ascophyllum nodosum, 20-45% DM for Laminaria digitata, 20-27% DM for Macrocystis pyrifera) (Rodriguez-Montesinos et al., 1991; Guiry, 2014). The cell walls of several orders of brown seaweeds, particularly of Fucales and Laminariales, consist mainly of fucoidans, which are composed from variable amounts of saccharide units with different degrees of sulfation (Mišurcová, 2012). 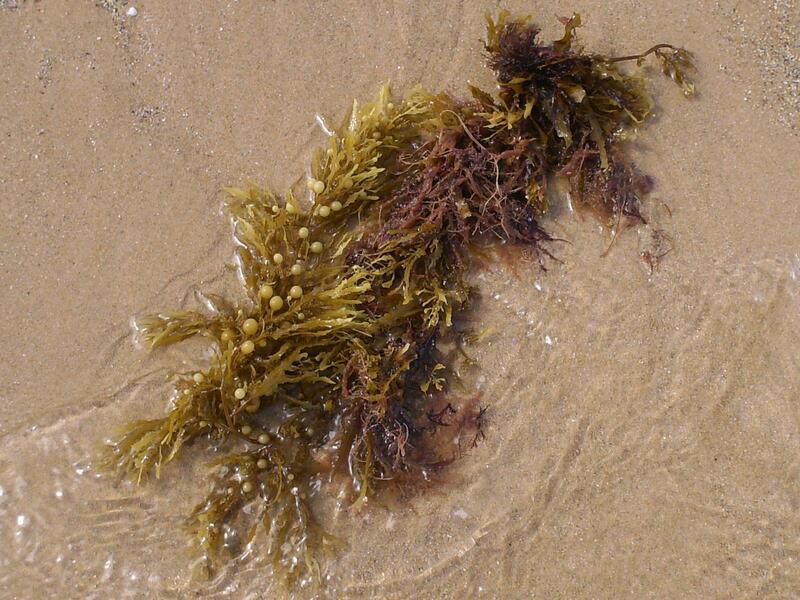 The principal carbohydrate reserve in brown seaweeds is laminarin (also called laminaran), a polysaccharide of glucose, unlike other seaweeds where starch is the storage carbohydrate. The brown colour results from the dominance of the xanthophyll pigment fucoxanthin, which masks the chlorophylls, beta-carotene and other xanthophylls (Guiry, 2014). Brown seaweeds are rich in potassium (2-3% in Ascophyllum nodosum, 1.3-3.8% in Laminaria digitata), sodium (3-4% in Ascophyllum nodosum, 0.9-2.2% in Laminaria digitata) and particularly iodine (up to 0.1% in Ascophyllum nodosum and 1.1% in Laminaria digitata) (Rodriguez-Montesinos et al., 1991; Guiry, 2014). Indeed, Laminaria has the capacity to accumulate iodine by more than 30,000 times the iodine concentration in seawater (Mišurcová, 2012). The composition varies according to different factors. For example, Macrocystis pyrifera harvested during summer on the coast of Mexico has higher amounts of minerals and amino acids than when harvested during winter (Castro-Gonzalez et al., 1994; Rodriguez-Montesinos et al., 1991). Ascophyllum nodosum contains large amounts of phenolic compounds (phlorotannins) that are insoluble in the digestive tract of animals (McHugh, 2003; Wang et al., 2008). One specific aspect of kelp is their high content of free glutamic acid, which gives the umami taste characteristic of the Japanese cuisine and which is used as a palatability enhancer in human food (Yamaguchi et al., 2000). Sargassum is poor in protein but is a good source of carbohydrates and of readily available minerals (Gojon-Baez et al., 1998; Marin et al., 2009). It is rich in beta-carotene and vitamins, and does not contain antinutritional factors (Casas-Valdez et al., 2006). Red seaweeds tend to be rich in protein, with a 10-29% DM range reported for Palmaria palmata (Galland-Irmouli et al., 1999; Mišurcová, 2012) whereas protein values in the 25-50% range have been reported for Porphyra species (Davies et al., 1997; Marsham et al., 2007). Unlike brown seaweeds, red algae contain limited amounts of iodine (0.03-0.04% DM), though still larger concentrations than in other plants (Mišurcová, 2012). The main storage polysaccharide of red seaweeds is the floridean starch, a polysaccharide close to starch that does not contain amylose. Cell walls of red algae are made of carrageenans and agars, which are phycocolloids of high industrial importance. They also contain cellulose, though in much more limited amounts than in higher plants: in particular, Palmaria palmata has a low concentration of cellulose, and Porphyra/Pyropia species contain insoluble mannan and xylan rather than cellulose (Mišurcová, 2012). Palmaria palmata is rich in some minerals (Na, K, Cl) and to a lesser extent in Ca, Fe and Mg. It contains few lipids (0.3 to 3.8% DM), but the fatty acid profile is rich in C22:6 n-3 (DHA) and EPA (Morgan et al., 1980). In Palmaria palmata harvested on the French Atlantic coast, a seasonal effect, due to the strength of the sun, was observed on the nitrogen content, which was the highest in winter and early spring, at the expense of carbohydrates, and the lowest in summer and autumn. The amino acid profile varied widely depending on the season: lysine, for instance, disappeared in spring and summer whereas the concentration of aspartic acid (relative to protein content) doubled in winter (Galland-Irmouli et al., 1999). Lithothamnion deposits are mainly composed of calcium carbonate and contain about 30-35% of Ca. Sea lettuce (Ulva lactuca) is relatively protein-rich (20-25% DM) and low in energy (Arieli et al., 1993; Ventura et al., 1998). When cultivated with nitrogen fertilizer, sea lettuce protein content can reach 50% (Bonnal et al., 2013). Sea lettuce contains both highly insoluble dietary fibre (glucans) and soluble fibre (Lahaye et al., 1993). Ruppia maritima and Chaetomorpha linum have a low protein content (12-15% DM) (Ktita et al., 2010). Marine algae concentrate inorganic elements from seawater and may contain heavy metals and other mineral contaminants. For that reason, seaweeds for food and feed are subject to national and international regulations concerning their content in trace elements. In the European Union, calcareous marine algae must contain less than 10 mg/kg, 15 mg/kg of lead and 1000 mg/kg of fluorine; seaweed meals and seaweed-based feed materials should contain less than 40 mg/kg of arsenic, and less than 2 mg/kg if requested by the competent authorities (all values relative to a feed with moisture content of 12%) (European Commission, 2011). The brown algae Sargassum fusiforme (Harvey) Setchell (synonym Hizikia fusiformis (Harvey) Okamura) is known for its high concentration of arsenic and is singled out in the latter Commission Directive (Moreda-Piñeiro et al., 2012). The Orkney sheep of the North Ronaldsay Island, who feed almost exclusively on seaweeds, absorb large amounts of arsenic, up to 100 times higher than the levels of unexposed sheep, which are excreted via the kidneys or stored in tissue samples or wool (Raab et al., 2002; Feldmann et al., 2000; Martin et al., 2005). Seaweeds, and particularly brown algae, contain high amounts of iodine and may cause iodine poisoning when fed for prolonged periods. In the European Union, the maximum iodine concentrations found in complete feeds are 2 mg/kg (dairy ruminants), 3 mg/kg (laying hens) and 3 mg/kg (horses) (EFSA, 2013). The high mineral content of algae has deleterious effects on the health of Orkney sheep: they suffer from severe dental disease precipitated by heavy deposits of tartar, and from extensive mineralization of the kidney medulla (Britt et al., 1990). The nutritive value of seaweeds for ruminants varies widely. It depends on the species, on the composition of the algae (protein, minerals, polysaccharides, tannins) and also on the adaptation of the animal to this particular feed. There are limited data on in vivo and in vitro digestibility, degradability and energy values of seaweeds for ruminants. The in vivo energy digestiblity of Ulva lactuca measured with young rams was 60% (Arieli et al., 1993). 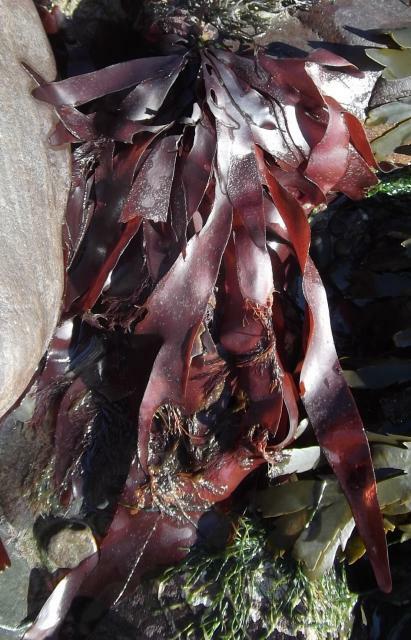 The in vitro OM digestibility of brown and red seaweeds, when measured with rumen fluid obtained from seaweed-fed sheep, was found to be very high for brown algae Laminaria digitata, Saccharina latissima and Alaria esculenta species (94, 97 and 81% respectively), and for the red algae Palmaria palmata (81%). However, it was low for other brown seaweeds such as Ascophyllum nodosum, Fucus serratus and Fucus vesiculosus (33, 15 and 26% respectively) (Greenwood et al., 1983a). In a comparison of the brown algae Macrocystis pyrifera and Sargassum spp., the in situ DM degradability of Macrocystis pyrifera was found to be low (50%) but higher than that of Sargassum (29%), due to a better composition of the former. Crude protein was found to be rumen-undegradable in situ, but to have a high in vitro trypsic digestibility, which could make brown algae a good source of protein for ruminants in spite of their low protein content (Gojon-Baez et al., 1998). Degradability values for the green alga Ulva lactuca were also relatively low (54% and 41% for OM and protein degradability respectively) (Arieli et al., 1993). However, the high mineral content of seaweeds limits their gross energy content, and, therefore, their digestible, metabolizable and net energy value: even a protein-rich (25% DM) alga like Ulva lactuca was found to have a digestible energy value of 9.1 MJ/kg DM, similar to that of a low-quality hay (Arieli et al., 1993). Seaweeds are typically low in cellulose (about 4%) and rich in specific polysaccharides (alginate, laminarin and fucoidan) and in mannitol. Sheep that are usually fed with seaweeds, such as the Orkney sheep, have a rumen flora that does not include phycomycete fungi or cellulolytic bacteria, but cilia species are present, including Dasytricha ruminantium and Entodinium spp., together with lactate-utilizing bacteria, such as Streptococcus bovis, Selenomonas ruminantium and Butyrivibrio fibrisolvens (Orpin et al., 1985; Greenwood et al., 1983a). As a consequence, the in vitro OM digestibility of seaweeds measured with rumen fluid obtained from grass-fed sheep (Orkney or another breed) was generally lower, particularly for Laminaria digitata and Saccharina latissima (Greenwood et al., 1983a). Kelp meal and extracts from Ascophyllum nodosum have been used to feed ruminants for decades. For example kelp meal is a common feed additive in dairy farms in the USA, notably in organically-managed farms. It is usually fed in low concentrations, typically less than 5% of the DM. As noted in Nutritional attributes above, kelp has a low protein and a high mineral contents, and, therefore, a low energy value. Also, kelp meal is not very palatable: kelp meal fed to calves at up to 60 g/d was found to depress DM intake, and it was suggested that the presence of free glutamic acid, which enhances palatability in human food, may have had an inverse effect in calves (Erickson et al., 2012). Kelp meal is, therefore, used in ruminants as an additive rather than in order to provide protein and energy. Early research found that it was a valuable source of minerals and could correct mineral-deficient diets for milk production, for example by providing copper (Dunlop, 1953). More recently, kelp meal and kelp extracts has been shown to enhance immunity and antioxidant properties in cattle, sheep and goats (Allen et al., 2001a; Allen et al., 2001b; Fike et al., 2001). Kelp meal increased the activity of superoxide dismutase, which is an antioxidant for ruminants raised on forage or pasture (Fike et al., 2001). In lambs and kids, kelp meal enhanced immunity, improved the overall health of the animals and protected them against prolonged heat or transport-induced oxidative stress (Kannan et al., 2007a; Saker et al., 2004). This latter effect may be due to the presence in kelp of sodium chloride and potassium gluconate (Archer et al., 2008). However, beneficial effects have not always been observed with transport-stressed animals and did not last more than 3 or 4 days in cattle (Pompeu et al., 2011; Williams et al., 2009; Galipalli et al., 2004b; Carter et al., 2000). No alleviating effects on body weight losses or blood metabolite levels were shown in goats (Kannan et al., 2007b). A kelp extract containing large concentrations of phlorotannins (up to 500 µg/ml) linearly reduced in vitro fermentation, of both mixed forage and barley grain. Inhibition of in vitro rumen fermentation was greater with cellulolytic bacteria than with amylolytic bacteria, which suggests that the influence of kelp on animal performance depends on the diet (Wang et al., 2008). 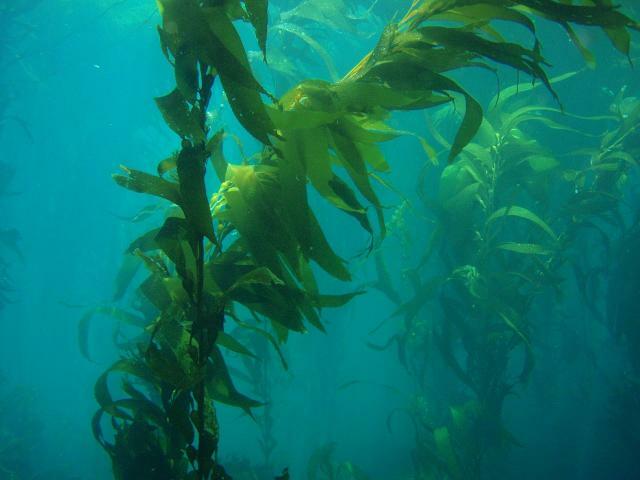 In steers, kelp meal increased the slowly degraded protein fraction and total protein degradability, and was more beneficial to forage digestibility when supplementing low-quality forage diets (Leupp et al., 2005). In feedlot cattle and lambs, kelp meal supplemented at 2% of the diet for 2 weeks at the beginning of the feedlot period maximized carcass weight and shelf life, with no detrimental effect on performance in the feedlot (Anderson et al., 2006; Tavasoli et al., 2009). In cattle and lambs, feeding kelp meal at 2% during the 2 last weeks before slaughter reduced animal shedding of Escherichia coli O157:H7 (Bach et al., 2008; Braden et al., 2004; Braden et al., 2007). In meat goats, the addition of kelp extract for 8 weeks before slaughter increased colour stability of loin/rib chops, even though there was no effect on lipid oxidation (Galipalli et al., 2004a). Feeding kelp extract sprayed on the pasture or mixed in the diet decreased the body temperature in steers suffering from a fever caused by fescue toxicosis (due to the infection of fescue with the fungus Neotyphodium coenophialum) (Saker et al., 2001; Spiers et al., 2004). Steers that had grazed the kelp-treated pastures had higher marbling scores and a better colour stability of the steaks (Allen et al., 2001a; Montgomery et al., 2001). The Orkney sheep in the North Ronaldsay Island feed almost exclusively on seaweeds for most of the year. Their preferred species are the brown algae Laminaria digitata, Laminaria hyperborea and Saccharina latissima (formerly known as Laminaria saccharina): these species may account for up to 90% of the diet in summer, depending on availability. They also eat other brown algae such as Alaria esculenta, Ascophyllum nodosum and Fucus species as well as red algae (Palmaria palmata) and green algae (Hansen et al., 2003). Their activity pattern depends on the tidal cycle, as the sheep eat the algae at night when the tide is low (Paterson et al., 1982). The sheep consume seaweeds in amounts high enough to sustain maintenance requirements, but they suffer from mineral overload (see Potential constraints above) (Hansen et al., 2003). Macrocystis pyrifera was used at up to 30% of the diet as a supplement for goats without affecting in vivo and in situ digestibility, and parameters of rumen fermentation, such as pH and ammonia nitrogen (Mora-Castro et al., 2009). In situ DM digestibility was high (77 to 85%). Including Macrocystis pyrifera in the diet increased rumen pH, water intake and urinary excretion (Gojon-Baez et al., 1998; Mora-Castro et al., 2009). Sargassum spp. were introduced at up to 30% in the diets of growing sheep and goats without depressing intake, growth performance and diet digestibility (Casas-Valdez et al., 2006; Marin et al., 2003; Marin et al., 2009). Feeding Sargassum increased water consumption, probably due to the high concentration of minerals, notably Na and K, which could make Sargassum less suitable for feeding during dry periods. Sargassum meal could be used to limit the decrease in rumen pH resulting from acidogenic diets. It also tended to decrease the concentration of volatile fatty acids (Marin et al., 2009). Palmaria palmata has a potentially high nutritive value in ruminants (Greenwood et al., 1983b). It was observed in the 19th and early 20th century to be very palatable to sheep, goats and cattle living on the shores of Northern and Western Europe (Brittany, Scotland, Scandinavia) (Sauvageau, 1920). However, neither Palmaria palmata or other red algae have received much attention in modern scientific literature concerning their use in animal feeding. There have been several experiments about calcareous seaweed extracts: for example Lithothamnium calcareum extract (containing 2.8% of Ca) fed at a ratio of 0.5 g/kg DM to steers receiving a diet with 70% concentrate had a buffering effect on rumen pH, but did not improve fibre digestion or modify rumen fermentation (Montanez-Valdez et al., 2012). In dairy cows, a by-product of agar production from Phyllophora added at the rate of 100 g/d to a diet deficient in copper, zinc and cobalt increased milk yield by 4.42% and milk fat content by 0.24% (Tolokonnikov et al., 1992). Information on green algae for ruminants is limited. Sea lettuce (Ulva lactuca) was fed to male lambs at up to 20% (DM basis) in a vetch hay/concentrate based diet without hampering the palatability of the diet. It had a low protein degradability (40%) but also a moderate energy digestibility (60%). Ulva was considered to be comparable to a medium to low quality forage and suitable for use with feeds that have a high energy/low protein content such as cereal grains (Arieli et al., 1993). In Tunisia, air-dried Chaetomorpha linum included at 20% in the diet of growing lambs (partially replacing barley) had a slightly depressing effect on growth and feed conversion ratio, possibly due to the higher ash content (Ktita et al., 2010). In the United Arab Emirates, an unspecified green seaweed (possibly Enteromorpha), harvested from fish ponds and dried, was included in the diet of growing lambs at 1%. The seaweed meal slightly depressed the feed conversion ratio but showed a tendency to decrease meat fat and digestive tract fill (Al-Shorepy et al., 2001). In the 19th and early 20th centuries in Gotland (Sweden), pigs were fed with a mixture of boiled brown algae Fucus vesiculosus and cereal meal (Sauvageau, 1920). A similar use was reported in Loch Feochan (Scotland), where boiled or raw brown algae Pelvetia spp. were fed with oatmeal to fatten pigs (Chapman et al., 1980). However, it has been shown that moderate to high amounts of brown seaweeds in the diet may be detrimental to pigs: Ascophyllum nodosum meal fed to pigs at 10% of the diet did not affect blood parameters but weight loss was recorded after several weeks (Jones et al., 1979). Nowadays seaweeds used in pig feeding are fed as additives in small amounts (1-2%) for their potential benefits for pig health and meat quality. In regions where part of the population suffers from iodine deficiency, the use of seaweeds in pig feeding has been proposed to increase iodine concentration in pig meat, as the organic iodine found in seaweeds such as Laminaria or Ascophyllum is readily metabolized and stored in the pig muscle, unlike inorganic iodine (Banoch et al., 2010). Feeding pigs with a diet containing 2% of dried Ascophyllum nodosum (the seaweed-based diet contained 10 mg/kg of iodine vs. 1 mg/kg for the control diet) increased the concentration of iodine in animal tissues by 2.7 to 6.8, depending on the tissue. This feeding strategy for producing iodine-enriched meat was found to be an easily controllable contribution to human iodine supply, without risk for overdosing or the need for a change in the eating pattern, but this contribution was thought insufficient to solve the national iodine deficiency in Belgium (Dierick et al., 2009). Seaweeds and seaweed extracts have been shown to have prebiotic effects and to enhance immune functions in pigs, and have been assessed as potential antibiotics replacers in pigs. There is an abundant literature concerning additives based on seaweed extracts, which are beyond the scope of this datasheet. For example laminarin and fucoidan extracted from Laminaria spp. were found to improve piglet performance, with laminarin being the main source for gut health and performance improvements (Gahan et al., 2009; McDonnell et al., 2010). In contrast, there have been few trials with intact seaweeds. In Japan, seaweeds of unspecified species fed over 76 days to 80 day-old pigs at 0.8% of the diet increased IgA production in saliva and global immune function (Katayama et al., 2011). In Belgium, in vitro investigations revealed a depressive effect of dried Ascophyllum nodosum on the gut flora of piglets, especially on Escherichia coli. Seaweed meal included at 1% in piglet diets reduced the E. coli load in the stomach and small intestine, while increasing the lactobacilli:E. coli ratio in the small intestine, indicating a greater resistance to intestinal disorders (Dierick et al., 2009; Dierick et al., 2010). However, in a later experiment by the same authors, seaweed meal added at 0.25, 0.5 or 1% to piglet diets of good digestibility failed to enhance performance of weaned piglets, gut health parameters and plasma oxidative status. The microbial ecology in the foregut and the caecum were unchanged. This lack of effect could be due to the presence of phlorotannins in Ascophyllum, which would counteract the prebiotic effects of other compounds, or it could be due to a too low inclusion rate. With regards to the unchanged oxidative status, antioxidant vitamins in the diet may have masked the antioxidant effect of the seaweed (Michiels et al., 2012). Seaweeds have been used in poultry to improve animal immune status, to decrease microbial load in the digestive tract, and for their beneficial effect on quality of poultry meat and eggs (Adubados et al., 2013; Wang ShuBai et al., 2013a; Wang ShuBai et al., 2013b; Ali et al., 2008; Zahid et al., 2001). Inclusion rates mentioned in the literature are generally low (1-5%). A comparison of raw, boiled or autoclaved Sargassum spp. included at up to 6% in broiler diets concluded that processed Sargassum did not have a better feed value than raw seaweed. Including Sargassum depressed growth but had no effect on dressing percentage and it enhanced polyunsaturated fatty acids and n-3 fatty acids, thus improving meat quality (El-Deek et al., 2011). Wakame (Undaria pinnatifida) included at up to 4% in broiler diets was shown to alleviate the negative impact of induced acute phase response, notably by reducing protein breakdown (Koh et al., 2005). Broiler chickens (1-8 weeks) fed a diet based on sorghum and soybean meal without or with 5, 10 or 15% dried seaweed (Macrocystis pyrifera) showed no significant difference among the groups in feed intake, but the weight at 8 weeks decreased significantly with the addition of seaweed (from 2.0 kg for the control group to 1.4 kg for the 15% seaweed group) (Carrillo et al., 1990). Calcified seaweeds are a valuable alternative source of calcium for broilers as their organic calcium is more available than the inorganic calcium from mineral sources such as limestone. While high dietary concentrations of calcium from limestone decrease phosphorus digestibility, the lower concentrations made possible by calcified seaweeds resulted in better bone health and reduced leg weakness and lameness (Bradbury et al., 2012). The green seaweed Enteromorpha prolifera fed to broilers at inclusion rates ranging from 2 to 4% provided best nutrient availability and high apparent metabolizable energy (maybe due to a high level of amylase in the duodenum). It had a positive effect on feed intake, feed conversion ratio and average daily gain while reducing abdominal and subcutaneous fat thickness, thus improving breast meat quality (Wang ShuBai et al., 2013a; Sun JianFeng et al., 2010). Inclusion of Ulva lactuca at 3% in the diet of broilers (12 to 33 day-old) had no effect on feed intake, body weight gain, feed conversion ratio and nutrient retention (Adubados et al., 2013). Inclusion of Ulva rigida at levels higher than 10% resulted in lower feed intake and reduced growth rate in 3 week-old broilers and cockerels (Ventura et al., 1994). Brown seaweed Sargassum spp. from the Red Sea shore fed to laying hens over 20 to 30 weeks at 1 to 12% of the diet had no deleterious effect on body weight, egg weight, egg production, feed conversion ratio and egg quality (El-Deek et al., 2009). Sargassum dentifolium fed raw, boiled or autoclaved at 3 or 6% was beneficial to egg quality: it decreased yolk cholesterol, triglycerides and n-6 fatty acids and increased carotene and lutein + zeaxanthin. Boiling improved high density lipoproteins, a desirable trait in cholesterol (Al-Harthi et al., 2012). The inclusion of 10% Macrocystis pyrifera in the diets of laying hens was found to be an effective way of increasing the n-3 FA content, the albumen height and yolk color, but not the egg weight, when these are enriched with n-3 FA from fish oil. The egg flavor was also not affected (Carrillo et al., 2008). The green seaweed Enteromorpha prolifera included at 1 to 3% resulted in improved egg production and quality: it increased weight, shell thickness and yolk colour, and reduced cholesterol in the yolk. It also resulted in a lower E. coli load in faeces, suggesting better animal health, and it was found to decrease the feed conversion ratio (Wang ShuBai et al., 2013b). Ascophyllum nodosum fed to rabbits at 10% of the diet resulted in severe decreases in haemoglobin, serum iron and packed cell volume, in body weight loss, and in the death of most of the rabbits (Blunden et al., 1973). The use of Ascophyllum nodosum as a feed ingredient for rabbits should, therefore, be avoided until further studies demonstrate its harmlessness and nutritional value. It must be noted that laminarin sulphate was found to be toxic to rabbits and dogs when it was tested as an anticoagulant in the 1950s (Kain et al., 1959). In rabbits with experimental hyperlipoproteinemia, Laminaria digitata fed at 1 g/d for 14 days lowered cholesterol and β-lipoproteins (especially triglycerides), while it increased the level of high density lipoproteins HDL-C and HDL2-C without affecting HDL3-C and packed cell volume (Tang et al., 1989). Calcified seaweeds, such as Lithothamnium, are used as a source of calcium for rabbits (Euler et al., 2008). For example in France, producers of organic rabbits have been reported to mix it with clay and salt and to offer the resulting product ad libitum in a corner of the cage (Leroyer et al., 2009). Lithothamnium spp. introduced in rabbit diets up to 1% (replacing bentonite) had no significant effect on growth and slaughter traits or on diet digestibility, but reduced the length and width of intestinal villi, which may have resulted from the increase in dietary calcium from 0.9 to 1.5% of the diet as fed (Euler et al., 2010). In Egypt, Ulva lactuca and Ulva intestinalis introduced at 1%, as feed additives in a 120-day study of the diets of growing Baladi rabbits, had positive effects on growth and diet digestibility, these being more notable with Ulva lactuca. Haematological and biochemical parameters did not show any negative effects on rabbit health (El-Banna et al., 2005). In Saudi Arabia, washed and sun-dried Ulva lactuca included at 1 or 2% in the diets of reproductive male and female rabbits for several weeks reduced significantly the adult body weight in both sexes (-7 to -8%). It increased testosterone in males (+12%) and plasma oestrogens in females (+125%). Sperm concentration, percentage of live spermatozoa and ejaculate volume were reduced while sperm motility was improved. Due to the small number of artificially inseminated does (10 per treatment) no significant effect on reproduction parameters was observed at kindling (the experimental diets were fed from one week before insemination until kindling) (Okab et al., 2013). In India, Ulva fasciata introduced at up to 15% of the DM in the diets of growing rabbit diets replaced the same proportion of the concentrate (distributed with 300 g/d of fresh alfalfa). Growth rate, feed efficiency and carcass characteristics were not affected, but faecal consistency became looser as the inclusion rate of algae increased from 10 to 15%. A maximum inclusion rate of 5% was, therefore, recommended (Raju et al., 1995; Sreemannarayana et al., 1995). In Tunisia, dried Ulva spp. was introduced up to 30% in rabbit diets with no alteration of growth performance and OM digestibility though it was associated with a reduction of carcass adiposity (Chermiti et al., 2009). In southern Italy, dried Ruppia maritima was proved suitable for feeding growing rabbits (Finzi et al., 1979). In Tunisia, it was introduced at up to 30% of rabbit diets with no alteration of growth performance and OM digestibility though it was associated with a reduction of carcass adiposity (Chermiti et al., 2009). Seaweeds are naturally eaten by fish and can be used in fish feeding either as a main ingredient (up to 100% in some species) or as a supplement (usually less than 10%). They can be offered fresh or dried and ground (seaweed meal). Many studies have assessed the value of seaweeds as a fish meal replacer. Earlier studies showed that diets containing 10-20% seaweed meal resulted in fish performance similar to that obtained with diets based on fish meal. Diets including higher rates of seaweeds tend to provide insufficient protein, causing lower fish performance (Hasan et al., 2009). Algae meal from the green seaweed Cladophora glomerata that completely replaced fish meal in Nile tilapia (Oreochromis niloticus) and Tilapia zillii resulted in reduced growth rates (58% of control) when it was used as the sole protein source (Appler, 1985; Appler et al., 1983). This poor performance was attributed to the presence of indigestible complex structural carbohydrates (Appler, 1985). However, seaweeds can be successfully used as partial fish meal replacers and thus be included in tilapia diets at 5-10% of the DM (Marinho et al., 2013; Stadtlander et al., 2013). In Portugal, Ulva spp. was included in juvenile tilapia diets at 10% without altering growth performance, protein utilization and protein retention and was, therefore, recommended as fish meal replacer (Marinho et al., 2013). In Turkey, the recommended inclusion level of Ulva rigida was 5% for juvenile Nile tilapia because it resulted in best rate of growth (Kut Guroy et al., 2007). Ulva fed to Nile tilapia that received a high lipid diet reduced lipid deposition in the fish and thus enhanced fish quality (Sebahattin et al., 2009). The brown seaweed Cystoseira barbata was recommended for juvenile Nile tilapia at the same dietary level (5%) as Ulva rigida (Kut Guroy et al., 2007). Red algae nori, Porphyra yezoensis, replaced 15% fish meal in intensively fed Nile tilapia without compromising growth or feed utilization. Tilapia fed Porphyra yezoensis had significantly lower oxygen consumption rates than the control fish (Stadtlander et al., 2013). In Egypt, Ulva lactuca meal was successfully fed to omnivorous striped mullet (Mugil cephalus L.) at 20% of the diet. Feeding Ulva was beneficial to fish performance and fish product quality as it decreased lipid deposition, reduced water content, and increased protein content in muscles (Wassef et al., 2001). Red seaweeds, Gracilaria lichenoides and Eucheuma cottonii, were used as the total diet for rabbitfish in net cages. Feed intake was increased but growth impaired (Tacon et al., 1990). Brown (Ascophyllum nodosum), red (Porphyra yezoensis) and green (Ulva pertusa) seaweeds have been assessed in the omnivorous Red sea bream with successful results, as feeding algae increased body weight gain and tended to increase feed efficiency and muscle protein deposition. Porphyra yezoensis had a better effect on growth and feed utilization than Ascophyllum nodosum and Ulva (Mustafa et al., 1995a; Mustafa et al., 1994). Feeding Undaria pinnatifida at 5% or Ascophyllum nodosum at the same level was recommended to enhance growth and feed efficiency (Yone et al., 1986). Feeding Ascophyllum nodosum at 5% had a beneficial effect on the muscle protein content (Nakagawa et al., 1997). The red seaweed Gracilaria lemaneiformis included at up to 15% did not affect the growth or physiological state of Black sea bream juveniles (Xuan XiongZhi et al., 2013). Feeding rainbow trout juveniles with brown seaweed Macrocystis pyrifera meal at 3 and 6% of the diet resulted in higher polyunsaturated fatty acids in their muscles and thus in higher product quality (Dantagnan et al., 2009). In European sea bass, dried red seaweed (Gracilaria bursa-pastoris) and green seaweed (Ulva lactuca) satisfactorily replaced 5 or 10% of a diet based on fish protein hydrolysate (Valente et al., 2006). Green seaweed (Ulva fasciata), red seaweed (Spyridia insignis) or brown seaweed (Sargassum swartzii, also known as Sargassum wightii), fed to omnivorous rohu fingerlings at 30% of the diet as a partial replacement for fish meal and groundnut meal resulted in better growth performance than the control diet. Ulva fasciata resulted in a better feed conversion ratio and could be a cost effective replacer for fish meal (Bindu et al., 2004). Common carp fingerlings fed 5 to 15% Ulva rigida meal as a replacement for wheat grain showed the best and most cost-effective performance at 5% level of inclusion (Diler et al., 2007). Seaweeds are valuable ingredients for shrimp pellets which remain longer intact in water if bound with algae meal (Cruz-Suarez et al., 2008). Seaweeds have been mostly studied in the white shrimp (Litopenaeus vannamei). In Mexico, feeding dried brown algae, Macrocystis pyrifera and Ascophyllum nodosum, or the cultivated green alga Ulva clathrata, had beneficial effects on shrimp growth, feed conversion ratio and colour (Cruz-Suarez et al., 2008). In Brazil, meal from the abundant red algae, Hypnea cervicornis and Cryptonemia crenulata, could be fed to shrimp larvae at up to 36% of the diet without hampering survival or performance. The highest inclusion rate resulted in a better feed conversion ratio, with no significant changes being observed in pond water quality (Silva et al., 2009). Meal of red seaweed Gracilaria cervicornis fed to juvenile Litopenaeus vannamei (0.34 g) as the sole feed for 30 days had no effect on shrimp health during the first 2 weeks but resulted in 60% mortality during the last period. When algal meal was mixed with a commercial feed (50:50), the survival was 100% and the best growth rates were obtained (Marinho-Soriano et al., 2007). Cradduck, W.C., 2001. Influence of Ascophyllum nodosum on selenium and antioxidants in beef cattle. Texas Tech Univ., MSc. Thesis in Anim. Sci., Texas Tech University, 85 pp. Edwards, M. ; Hanniffy, D. ; Heesch, S. ; Hernández-Kantún, J. ; Moniz, M. ; Queguineur, B. ; Ratcliff, J. ; Soler-Vila, A. ; Wan, A. , 2012. Macroalgae Fact-sheets. Ed. Soler-Vila, A. & Moniz, M., Irish Seaweed Research Group, Ryan Institute, NUI Galway, 40 p.
El Gamal, A. A., 2012. Biological importance of marine algae. In: Se-Kwon Kim (Ed. ), Handbook of marine macroalgae: biotechnology and applied phycology. John Wiley & Sons, 567 p.
Guiry, M. D. ; Blunden, G., 1991. Seaweed resources in Europe: uses and potential. Wiley, 432 p.
Mišurcová, L., 2012. Chemical composition of seaweeds. In: Se-Kwon Kim (Ed. ), Handbook of marine macroalgae: biotechnology and applied phycology. John Wiley & Sons, 567 p.
Moreda-Piñeiro, A. ; Peña-Vásquez, E. ; Bermejo-Barrera, P., 2012. Significance of the presence of trace and ultratrace elements in seaweeds. In: Se-Kwon Kim (Ed. ), Handbook of marine macroalgae: biotechnology and applied phycology. John Wiley & Sons, 567 p.
Naylor, J., 1976. Production, trade and utilization of seaweeds and seaweed products. FAO Fisheries Technical Paper, N°159, 73 p.
Sauvageau, C., 1920. Utilization of marine algae. Librairie Octave Doin, 412 p.